When I was pregnant with Caroline, we would go to Coldstone Creamery when the craving for ice cream hit. My favorite combo was banana ice cream with Reese's peanut butter cups, and as far as Joey was concerned, I might as well have been eating pickles with it. I'm not sure why it grossed him out so much - I'd still gladly eat that combo today! I'm not sure where I got the idea for these cupcakes, but I've been talking about making them for months now with my friend Michelle. I only just realized that its basically the same combo as my favorite pregnancy treat. They are based off of the popular Ben and Jerry's ice cream flavor, which is vanilla ice cream with chocolate covered pretzels and peanut butter. When dreaming up these cupcakes, I for some reason thought they had banana in them, but it turns out I was just combining Chubby Hubby with Chunky Monkey. So maybe these should be called Chubby Monkey? Or Chunky Hubby? No matter what you call them, they are quite a tasty treat: banana cupcake filled with chocolate ganache, and topped with peanut butter frosting. 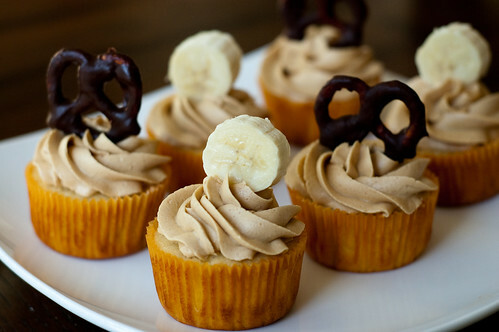 I dipped some pretzels in the ganache to top some of the cupcakes with, and I topped the rest with banana slices. For the cupcakes, Preheat the oven to 350. Line a muffin pan with cupcake liners. Combine the flour, baking powder, and salt in a medium bowl. In the bowl of a stand mixer fitted with the paddle attachment, cream the butter and sugar at medium speed until light and fluffy. Add the eggs, one at a time, until thoroughly combined, scraping the sides of the bowl as needed. Add the banana and mix until well combined. Combine the buttermilk and banana extract in a liquid measuring cup. Over low speed, Alternately add the flour mixture with the buttermilk, starting and ending with the flour. Mix until just combined. Divide the batter evenly among the muffin tins, filling each one 3/4 full. Bake 20-25 minutes, or until firm in the center and a toothpick comes out with only a few crumbs attached. Remove from oven and allow to cool in pans 5 minutes, then transfer to a wire rack to cool completely. For the ganache, place the chocolate in a medium bowl. Bring the cream to a gentle boil in a small saucepan. Pour it over the chocolate, and allow to sit for 3-4 minutes. Add the butter to the bowl, and whisk until smooth. Allow to sit at room temperature until it reaches a consistency suitable for piping, or refrigerate, being sure to stir every 10 minutes. For the frosting: Place the confectioners' sugar, butter, peanut butter, vanilla, and salt in the bowl of a stand mixer fitted with a paddle attachment. Mix on medium-low speed until creamy, scraping down the sides as needed. Add the cream and beat on high speed until light and fluffy, 3-4 minutes. To assemble, use a small paring knife to cut out a small cone from the top of each cupcake. Fill a pastry bag fitted with a round tip with the ganache, and pipe each cupcake full of ganache. Frost as desired with peanut butter frosting. ohmygodineedthesenow. Really Josie, great idea! I can't wait to try them. Hmm...I see 3/4 cup mashed banana in the ingredient list, but it is not used in the directions. Is this correct? Chubby Hubby is my favorite Ben & Jerry's by far. What a clever idea! The cupcake ganache filling just takes these over the top! Christina, I've corrected the error, thanks for pointing it out. All of my favorite flavors and the chocolate covered pretzel on top is so cute. What a great idea! Who wouldnt' love the chocolate, PB and banana combo! Pregnant or not. I have to say I love it and am DEFINITELY not pregnant. These cupcakes sound amazing. Whoa. These are a dream come true. It's surprising that there actually is mashed banana in the recipe because usually it leaves little black fibers in the batter, especially with 2 whole bananas. These cupcakes look very white. How did you manage that? mmm... banana, chocolate and peanut butter make a fabulous combo! I didn't do anything special... the bananas I used weren't super ripe, so maybe that had something do with it, who knows. I must make these for my friend! She loves this flavor in ice cream. Now I need to figure out the best way to ship them haha. Oh my gosh...these looks so good! I've made a total of 8 cupcake recipes in the last 4 days for different reasons, and I'm wondering if it's excessive to make a ninth? Darn that swimsuit season!!! OMG these look and sound amazing! Can not wait to try them!! I will be linking back to you on this real soon!! These look so good! Absolutely genius! I've always wanted to try chubby hubby ice cream but we don't have it in Canada!! These cupcakes sound amazing and look beautiful. i've decided to test these cupcakes out next week on my summer students and i'll let you know what they think. although...i'm SURE they'll love them since they look amazing! thank for the suggestion Josie! oh and PS - Ina's pb frosting recipe is hands down my absolute fav and i can't wait to use it again on these!! Yay, I hope you like them!!! And I agree, Ina's pb icing is the bomb! I have to try these. They look yumy. The peanut butter frosting looks light and fluffy, and I think the ganches filling will taste great. . mmmmm. i'm from the UK and would really love to make this cupcake, but don't understand your quantities! Please could you explain in grams or ounces?? I made these & brought all the extras in to work. Coworkers went "bananas" over them. I love it. Thank you so much. Chubby Hubby is my favorite ice cream! 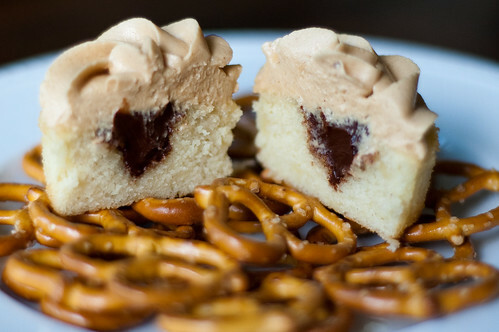 I can't wait to make these cupcakes!